Rock climbing is a sport related to mountaineering which involves scaling vertical walls using your own strength, agility and balance to find toeholds for hands and feet. Special rubber climbing shoes are often used which increase the adherence of the feet to the toeholds. Climbers use a rope to secure themselves on vertical terrain. The rope protects the climber in case of fall and allows them to rest if necessary. The introductory course involves grade 4 and 5 short climbs up to 20 meters in height, where it is easy to find comfortable toeholds for both hands and feet. Not recommended for those who suffer from vertigo. Rock climbing requires strength and resistance mainly in arms and legs. Children must be 7-year-old or more and have the permission of a parent or guardian. It is important to focus on the safety instructions provided by the guide. 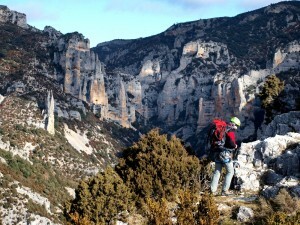 Locations: Rock Climbing at the Sierra de Guara. Peña Castibián in Alquézar is an ideal spot to spend half-day climbing. It is a good area for beginners and enjoys the shade in the mornings. • Sports shoes or walking boots. • Warm clothes (depending on the season, please consult). • Plenty of drinking water and when combined with the abseiling activity in the afternoon, a picnic lunch. (Picnic lunches can be ordered the day before). Rock Climbing. Equipment provided by us. • Ropes, carabiners, quick draws and other safety equipment. • Health and rescue insurance. • 2 participants: 68 euros. • 3 participants: 62 euros. • 4 participants: 58 euros. • From 5 to 8 participants: 52 euros. Introduction to Climbing will be charged at the same rate as Level 2 Canyoning. Level 2 Climbing will be charged at the same rate as Level 3 Canyoning. Multi-pitch Climbing will be charged at the same rate as Level 4 Canyoning. • Prices for groups of 8-15 participants will only apply when the group books together. • Prices do not include travel to and from the activity. Participants should use their own vehicles. • Prices include: a specialized guide, mandatory insurance and technical equipment necessary for the activity. VAT included. Level 2 Climbing includes more demanding routes (grade 5+ to 6b). The length and technical difficulty of the routes make finding toeholds and adopting the correct body position more important. In general terms toeholds for both hands and feet are smaller, less comfortable and may be more difficult to locate. Occasionally there may be isolated overhanging moves. One of the objectives in Level 2 Climbing is to teach the group safety techniques so that the participants can acquire autonomy as climbers. Having Experienced sport climbing on several occasions. Being able to climb confidently at a least grade 4.  Basic notions of balance and body position on vertical terrain. At this level, explosive strength and resistance come into play. 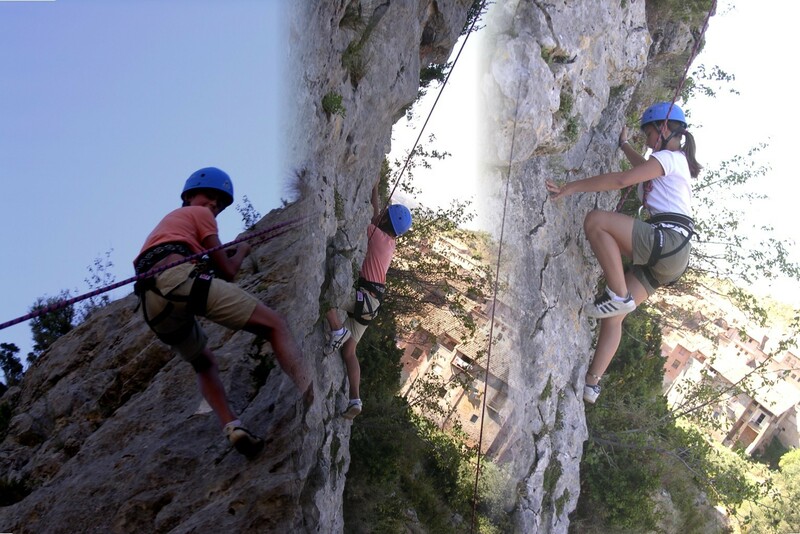 Rodellar is the climbing area which offers the best range of climbs in Sierra de Guara. There are a great number of excellent routes to be found in a relatively small area and at any time of the year. Other local crags include the Congosto de Olvena (between Barbastro and Graus) and Vadiello among others. • 2 participants: 83 euros. • 3 participants: 75 euros. • 4 participants: 67 euros. • From 5 to 8 participants: 63 euros. Climbing: Introduction to Climbing will be charged at the same rate as Level 2 Canyoning. Level 2 Climbing will be charged at the same rate as Level 3 Canyoning. Multi-pitch Climbing will be charged at the same rate as Level 4 Canyoning.